[through the elders]. And you do many things such as that. The context of this passage is that we see Jesus addressing the Pharisees after they have confronted Him about the actions of His disciples. They asked the Lord why His followers did not live their lives according to the traditions of the elders -- specifically, that they ate without cleansing themselves completely (according to the ancient rituals). Jesus doesn't hold anything back when answering them. He calls them hypocrites, which in the Greek means, pretending to play a part. He then goes on to say that the prophet Isaiah described such religious pretenders like this: professing faith in God, while their hearts were empty of His presence; their worship was merely a pretense (a false display of feelings, attitudes, and intentions). Isaiah went on to declare that these kinds of people and religious leaders teach the rules and doctrines of men -- giving their traditions and ideology equal weight (value, significance) as the Scriptures. 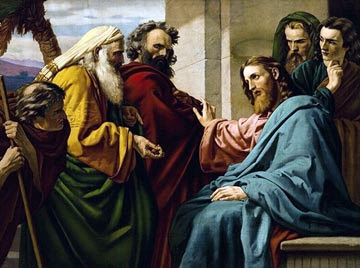 Jesus then adds His own evaluation of their words and actions: The religious leaders were clinging faithfully to their man-made traditions, while disregarding and neglecting the commandments of God. External appearances and man-made rituals and doctrines were replacing the Divine rule of God. And then came the final pronouncement: They have made the Word of God of "none effect". Various translations use the word "disannul" or "nullify" [as here in the Amplified Bible]. The significance of this word is the effect it has to "deprive of authority". By choosing to follow their own rules and rituals, which were adaptations of the Scripture, these men were robbing the Word of God of any authority it might have had. They were acting as if the traditions and rituals handed down to them by religious leaders and elders of the Faith took supremacy over what God had commanded them to do. In essence, they were acting as if God's Word did not apply to them and they had chosen to follow men instead. In this case, it was only about cleansing before eating, but Jesus accuses them of doing many more things that followed man's guidelines rather than God's. Are we any different today? I would venture to say that we all have our "doctrines" that we swear are supported by the Bible. Two thousand years of Church creeds, tenets, dogma, canons, and reformations have made it near impossible to be completely free of some man-made doctrine. When you just consider the basic doctrines of the Christian faith, you can see where man's influence has resulted in the confusion over God's Word, and the lack of the absolute authority of YHWH alone. How many different opinions do modern Christians have about The Trinity, the Deity of Christ, Jesus's Second Coming, Salvation, Baptism, The Lord's Supper? And what about The Tribulation? There are Christians who can't agree whether Christ's return is Pre-, Mid-, or Post-. Then there is the Millennial Kingdom. We have believers calling themselves pre-millennialists, post-millenialists, and amillenialists. We have Calvinists and Arminians. We have Dispensationalists, Evangelicals, and Zionists. Not to mention all the "movements" within Christianity: the Emergent movement, the Charismatic movement, the Prosperity Movement, the Free Grace movement [which somehow differentiates itself from the Grace movement], the Hebrew Roots movement, the Lesbian and Gay Christian movement, the Restoration movement... and the list keeps growing. And how many people have searched the Word to see if what they believe actually adheres to God's commandments? Have we made Him our authority, or are we following the traditions of men in the Church? But what do they all have in common? They all look to some man's interpretation of Scripture to define their faith! Can you see that all these names are just modern renditions of "Pharisee" and "Sadducee"? We have all been guilty, at one time or another, of applying some man-made tradition to our worship of YHWH. And like Jesus said, we disregard and neglect the commandment of God, and cling [faithfully] to the tradition of men. We have followed the tenets and teachings of our particular denominations, often not even bothering to see if they are confirmed by Scripture. By doing that, who are we giving authority to? If we aren't searching the Word of God to see what He commands of us in any particular tradition or ritual of our church, then we are certainly not making Him the principal authority. And if we don't care enough to even "check and verify", what does that tell Him about how we regard His Word? Aren't we just as guilty of "disregarding and neglecting" God's commandments as these religious leaders in Mark, Chapter 7? Throughout the centuries, men have left their mark on God's Word. Whether it has been John Calvin, Martin Luther, William Tynedale, John Wesley, or Billy Graham, men have long attempted to interpret God for God. I am not disparaging the faith of these men, nor necessarily negating their impact on millions of people who might not have known God otherwise. But just like the traditions of the Jewish elders prior to Christ, they have often added new layers of interpretation to God's Word. When in reality, He doesn't need any other interpreter than the Holy Spirit, about whom Jesus told us, when He, the [Holy] Spirit of Truth, comes, He will guide you into all the truth [full and complete truth]. For He will not speak on His own initiative, but He will speak whatever He hears [from the Father—the message regarding the Son], and He will disclose to you what is to come [in the future]. How much of what we hear and believe and practice in the Church today comes from the initiatives of men? I clearly remember a time when the Holy Spirit whispered to my spirit, and I began to feel empty and unfed. It was difficult to accept, but I had to admit that as I sat in Church each Sunday I wasn't hearing or tuning into the Holy Spirit. Then it was as if He said, Why are you sitting there listening and not seeking for yourself? I have so much more to share with you; truths and commands from the Father that you have never heard. Seek Him and His Son [in His Word] and I will show you new things you are to do for the Kingdom of God, for it is time for you to live out your faith, and you don't even know what that looks like. Stop giving men your devotion and look to the Lord for His full revelation. I know there are more Christians like me; faithful Believers who are waking up to the fact that we have been blindly following the traditions that have been handed down from the elders of our denominations. We want the direct revelation from the authoritative voice of God, and we are throwing off labels and religious titles for the one designation that counts ... Child of God and Follower of Jesus. By doing that, we are seeing the Word through fresh and uncompromised eyes and hearts. We are now seeing, for the first time, the commandments to heal, and to cast out demons, and the part we are to play in advancing the Kingdom of God on earth. We no longer shy away from the "difficult" Scriptures because no one in our Church can explain them. We recognize that God and Jesus are the authorities to which we answer, and I am so blessed to be among a growing number of Christians who are listening to the Holy Spirit, and seeking God's authority in revealing His Truth. The evil one has spread many, many tares among the wheat. I will tell you that you must spend time in prayer for you will need Holy Spirit discernment to seperate the 'wheat from the chaff'. The broad path is easy to follow, but it's easy to get 'out in the weeds' when you're on narrow one. What you will learn will change your life; you will never be the same as you were. As you begin to share what you've learned, you may find friends and family unwilling to listen to you because very few believers want to really know these things and all the implications. But you will surely find Him when you seek after Him with all your heart. So be kind and gentle; as they are now, you once were. Most will prefer blind allegiance to what they were always taught. When they are ready the Father may call to them to draw closer, just as He has done with you. Bill, what a powerful testimony! And I think at the heart of what you have shared is this fact: to draw closer to Him, you must ask questions of your own faith to know EXACTLY what you believe and why -- always using Scripture as your source and the Holy Spirit as your guide and counselor. Thank you for giving a loving and honest portrayal of your own journey, and encouragement for all of us to continue to seek YHWH. And you are correct, although many may choose to cling to the false traditions of their faith, we need to pray that they will answer the Father's call to their hearts. Bless you for sharing this wise counsel!